Single doses or daily dose should not exceed 2 g.
Hypnotic: 500 mg–1 g PO or rectally 15–30 min before bedtime or 30 min before surgery. It is not usually considered safe practice to give oral medication to patients who are NPO for anesthesia or surgery. Sedative: 250 mg PO or rectally tid after meals. Hypnotic: 50 mg/kg/day PO up to 1 g per single dose; may be given in divided doses. Sedative: 25 mg/kg/day PO up to 500 mg per single dose; may be given in divided doses. 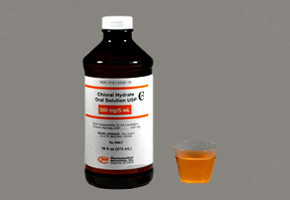 Chloral hydrate is used principally as a hypnotic in the treatment of insomnia; effective only for short-term use. Its CNS depressant effect, similar to those of paraldehyde and barbiturates, may be attributed to its metabolite, trichloroethanol. Gastric irritation, abdominal distention and flatulence, vertigo, ataxia, staggering gait, rashes, malaise, lightheadedness, headache, ketonuria, excitement, nightmares, delirium (especially in elderly), eosinophilia, reduction in white blood cell count; dependence on prolonged use. Hepatic or renal impairment, cardiac disease, hypersensitivity, porphyria, esophagitis, gastritis. Pregnancy and lactation. Give capsules with a full glass of liquid; ensure that patient swallows capsules whole; give syrup in half glass of water, fruit juice, or ginger ale. 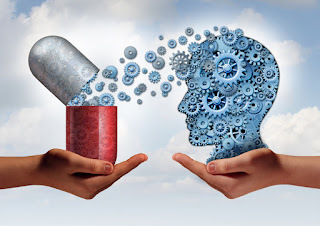 Supervise dose and amount of drug prescribed for patients who are addiction prone or alcoholic; give least amount feasible to patients who are depressed or suicidal. Withdraw gradually over 2 wk if patient has been maintained on high doses for weeks or months; if patient has built up high tolerance, withdrawal should occur in a hospital, using supportive therapy similar to that for barbiturate withdrawal; fatal withdrawal reactions have occurred. Reevaluate patients with prolonged insomnia; therapy for the underlying cause (eg, pain, depression) is preferable to prolonged use of sedative–hypnotic drugs. Take this drug exactly as prescribed: Swallow capsules whole with a full glass of liquid (take syrup in half glass of water, fruit juice, or ginger ale). Do not discontinue the drug abruptly. Consult your health care provider if you wish to discontinue the drug. Avoid alcohol, sleep-inducing, or over-the-counter drugs; these could cause dangerous effects. You may experience these side effects: Drowsiness, dizziness, light-headedness (avoid driving or performing tasks requiring alertness); GI upset (eat frequent small meals); sleep-walking, nightmares, confusion (use caution: close doors, keep medications out of reach so inadvertent overdose does not occur while confused). Report rash, coffee ground vomitus, black or tarry stools, severe GI upset, fever, sore throat.